To determine whether you have foraminal stenosis, your doctor will examine your back and your medical history, and may order an x-ray, computed tomography (CT) scan or magnetic resonance imaging (MRI) scan of your spine. 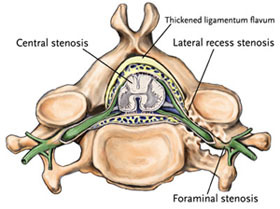 How Is Foraminal Stenosis Treated? If there is minimal nerve involvement and your symptoms are mild and do not interfere with daily life, your doctor may prescribe one or more of the following conservative therapies to treat your condition. Medication — Over-the-counter medications such as a non-steroidal anti-inflammatory drug (NSAID) or, if this fails to provide relief, a prescription pain reliever, steroid or muscle relaxer. External bracing — To support the spine during the healing process. Laminectomy — A procedure in which the lamina of the affected vertebrae (the portion of the vertebral arch that forms the “roof” of the spinal canal) is removed or trimmed to widen the foramen and create more space for the spinal nerves. Anterior cervical discectomy with fusion — A procedure in which the intervertebral disc is removed and the disc space distracted to “re-open” the foramen and give the nerve roots more room, and the vertebrae then joined together (fused) by placing bone graft between the affected levels. The graft material acts as a binding medium and also helps to maintain normal disc height – as the body heals, the vertebral bone and bone graft eventually grow together to join the vertebrae and stabilize the spine. These procedures may be performed using traditional, “open” or minimally invasive surgical techniques, depending on your condition and your doctor’s preference, experience and training. The decision to treat foraminal stenosis surgically requires careful consideration between you and your doctor. Factors to be considered are your specific condition and overall physical health. Discuss your condition thoroughly with your doctor, and rely on his or her judgment regarding which treatment option is most appropriate.